I have not been doing alot of sewing lately or blogging since I finished my O'Christmas Tree quilt. I got it all quilted, bound and washed. When I pulled it out of the wash one of the blocks had come to pieces. It was a block someone had made for me in one of my Quilting Bees. They had used reverse applique. All I can say is that I was so upset and sad. So much work went into making the quilt and now it was ruined. My options are to un-pick the binding, the border then un-pick the whole block and take it out and make a new block and sew it in and re quilt it and bind it. 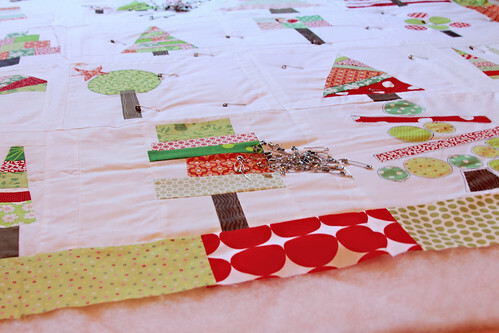 I can applique over the block with stabilizer and then just quilt around the tree through all three layers. Either option sounds not so fun and makes the quilt something different. So needless to say it has given me pause in sewing. Today I finally felt the need to sew and picked up Gwen's blue blocks and started to make some more blocks then I ran out of white kona. Of course! I still need to make 6 more white blocks and 7 more print blocks but I can't wait to get it done it is going to be soooo Gweniveve. Every print is different so every block is unique and also means that I have ALOT of blue fabrics!!! Wow, that is just plain awful. I hope you find a way to applique over it that pleases you so you don't have to rip so much out and redo. 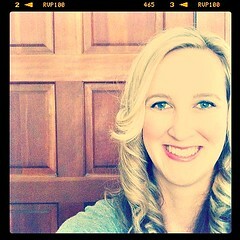 ooh yucky yuck! I've been waiting to see this quilt finished too! 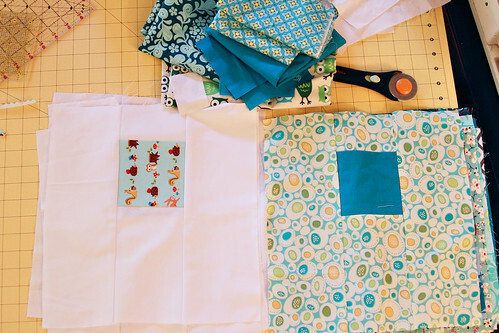 On the plus side for the rest of us, it's a good warning to the rest of us about those applique bee blocks to make sure everything is secure before we quilt!